This video has now been replaced by MTG409, however when you buy MTG409 you get MTG217 free. So go here to purchase both. As all of the Internal forms and fighting styles came from the WUDANG SHAN system's 12 Wudang forms, so too do the two person sets from Taijiquan and Baguazhang come from the 12 Wudang Hand Weapon training sets. Before push hands, there were the 12 Wudang Hand Weapons. There are the precursors to push hands. Not the silly 'you push me, I push you' type of push hands that most schools now teach and often go into competition with! 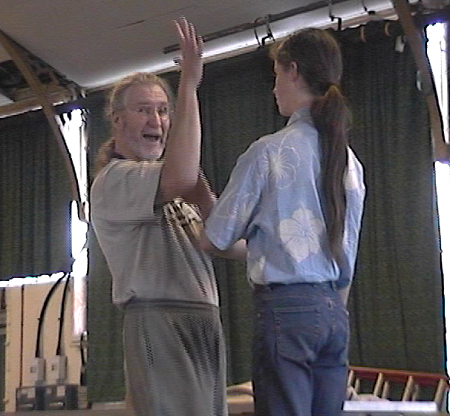 But rather the excellent p'eng/hinge, fighting push hands methods of today and the Erle Montaigue system. These 12 two person training methods teach you everything you need to know in order to turn your fighting into reflexive actions that will just happen automatically when attacked. If anyone asks me about what training methods I advise to learn how to fight, I tell them the 12 Wudang methods, along with most of the other stuff, but these are really special. Hammer: This two person set makes use of the closed fist using the base of the fist as a hammer. It attacks the CO 10 or 12 points in a devastating 'Point Set Up' strike, ST 9 and 10 (neck), GB 3 (Temple) and again ST 9. Then in retaliation of this last strike, your partner then has a go.Spear: This one is deadly and caution must be taken when training as the eyes are involved. The points struck are; CO 10, eyes (scraping the finger nails across them), eyes (same in the opposite direction), CV 22 (by spearing it) and ST 10. Sword: This one is also very dangerous; CO 10 (Set Up), ST 0, ST 10, ST 11, TH 17, Neck in general, GB 3 (Temple) and ST 9 and 10. Plough: This one is wonderful as it trains your reflex actions to perfection; Neigwan (both hands), 4 Neck points, LU 5, CV 22 (Neck in general). Axe: This one attacks to; LU 8 (Both sides), Both sides of the neck chopping, chopping down onto either side of the neck covering many deadly points, back into LIV 13 both sides. The Nun: The 'Nun' is a 3 section Chinese implement for thrashing wheat or rice. It has been modified in its physical weapon form for fighting. This one attacks to mainly the neck and arms using the arms and hand weapons in the typical Bagua type 'Nun' posture so that the arms look like a 3 section staff.